Two creeks spill over this ledge into a dark cove - the one on river left is higher than the one on the right. 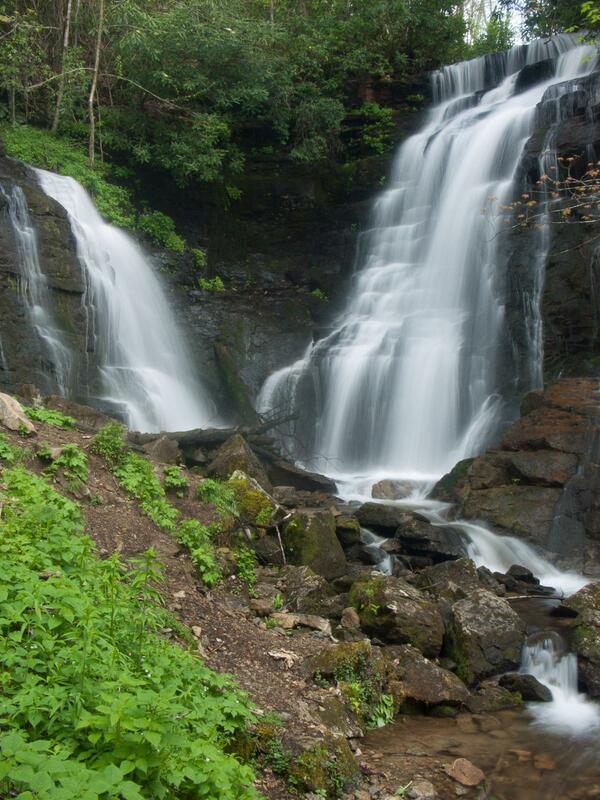 Both are a combination of steep cascades and free-falls. Rhododendrons and northern hardwoods surround the falls in the lush cove. From the intersection of US Hwy. 19 and the Blue Ridge Parkway, follow US 19 toward Cherokee (north/west) for about 1.4 miles. A sign for Soco Falls will indicate your approach to the pull off, which is a large gravel parking area on the left. Park here. The trail starts at the east (uphill) side of the guardrail and descends about 50 feet over 300 feet in length. Some steps and a good path let you down to the viewing platform, with the falls below you in elevation. For your own safety, stop here - the view is pretty good, and any unofficial routes to the base are quite dangerous.